attic of mq.90 placed on the third and last floor in the center of the poor, in a small building of only three units', with elevator / private elevator, no condo fees. no agency fees. The apartment is tastefully renovated, has double glazing, heating and air conditioning, large living room with kitchenette (custom-made - with refrigerator, dishwasher hob, extractor hood and wall units, including peninsula table ), loggia of mq.5 with sunshade, double bedroom, a hallway and large bathroom with Jacuzzi tub and separate shower, a laundry room, facilities under. 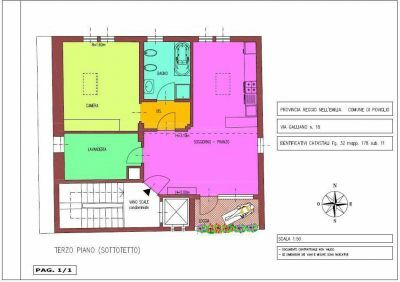 Possibility of buying in the same building a deposit on the ground floor of mq.42 with three windows and two accesses one with tilting from the private courtyard and one with a door located on the back village. possibility 'also to buy another apartment of mq. 90 with a small cellar, located on the second floor. confidential negotiations for the purchase of all three properties.